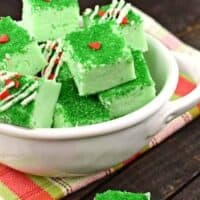 This festive Grinch Peppermint Fudge is creamy and melts in your mouth! You’ll love how easy it is to make, and it’s fun to see on a plate of cookies and candy! I’ve got a thing for fudge. And every holiday includes some new, festive ideas! 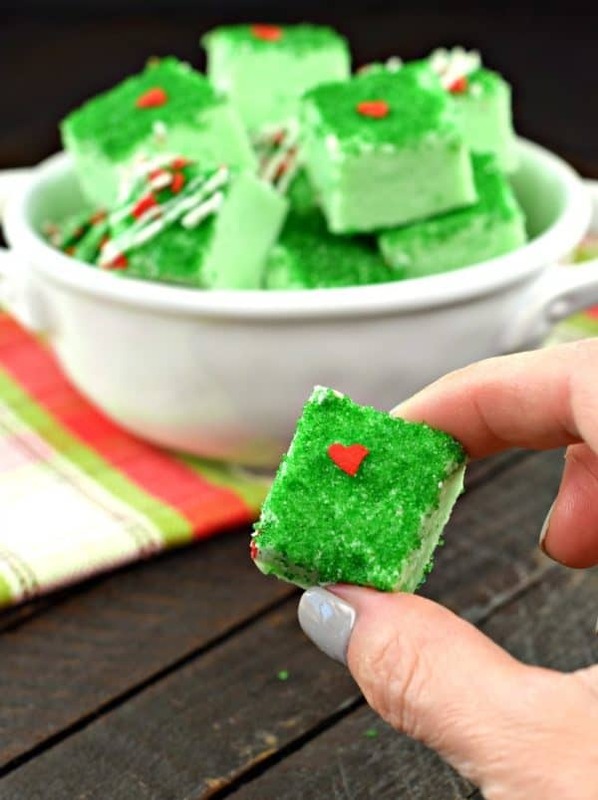 Today’s Grinch Fudge is a sweet, peppermint fudge with a green “grinchy” color and a heart too small. I’d love to hear some of your holiday traditions. As my kids are now older, I hear of people doing certain things and I think, dang, I wish I had done that! One thing that never changes is the gifting of holiday pajamas on Christmas Eve. Sometimes the jammies are festive, and sometimes they are just new pajamas. But this way they have something clean and cute to wear to bed and lounge around in all day for Christmas (we don’t go anywhere on Christmas Day). My husband gets a new Grinch shirt every year, haha. I can’t help it. It started maybe 5 years ago when we started teasing him and calling him the Grinch because he wouldn’t let us put up holiday decorations before Thanksgiving. Other holiday traditions? The making of Christmas candy. Some people make a dozen types of cookies…we make candy. 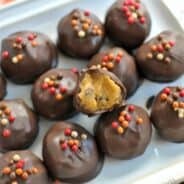 English Toffee, fudge, and truffles. Usually about 20 batches of English Toffee get made during the month of December….this year we haven’t even started yet. So behind…. Don’t know how to make fudge? Don’t worry, it’s easy! First, line a square baking dish with parchment paper and set it aside. Next, add your white chocolate chips, marshmallow fluff, peppermint extract and green food coloring to a mixing bowl. Set this aside (you’ll pour the hot mixture over all of this, so it’s good to be prepared)! Boil your butter, sugar, cream, and salt. Once it begins to boil, boil for a full 4 minutes. This is important! Then pour the hot mixture into the mixing bowl with your other ingredients. BLEND WELL until all the white chocolate chips are melted. Pour immediately into your prepared baking dish and sprinkle generously with green sugar and red hearts. Okay. So this is where I made a mistake. In my video below, I sprinkled too much, too late so it didn’t stick. Then I drizzled a little white chocolate over the top (not on the video) to help it stick. That worked. Since you won’t be making a video (and you can work quickly without having to worry about getting it on video), as soon as you pour your fudge into the pan, add your sprinkles and use your hand to press them into the hot fudge. Still looking for holiday treats? 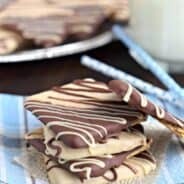 These Holiday Scotcheroos are so easy to make and so festive too! 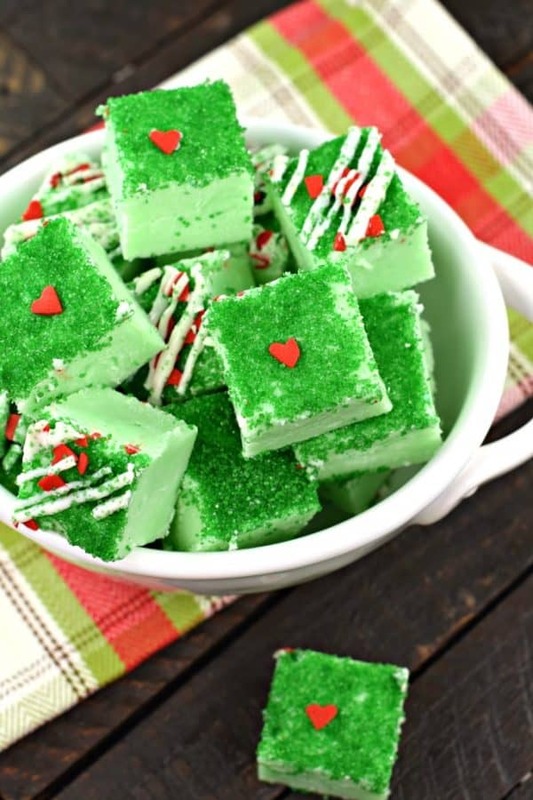 How cute are these Grinch Sugar Cookies Bars from Lisa at Wine & Glue? 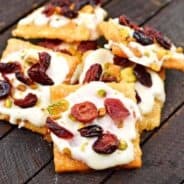 So easy to make, and the kids will love them! This Candy Cane Fudge is packed with peppermint flavor. Swap out the minty candy canes for some of the new fun flavored ones for a special treat! Can I interest you in a Grinch-tini? Thank you Becky from The Cookie Rookie for this adorable drink! Cheers! Finally, let’s not forget the Grinch Drink I made a few years ago. Fruity and fun, this adult beverage will be the star of your holiday! 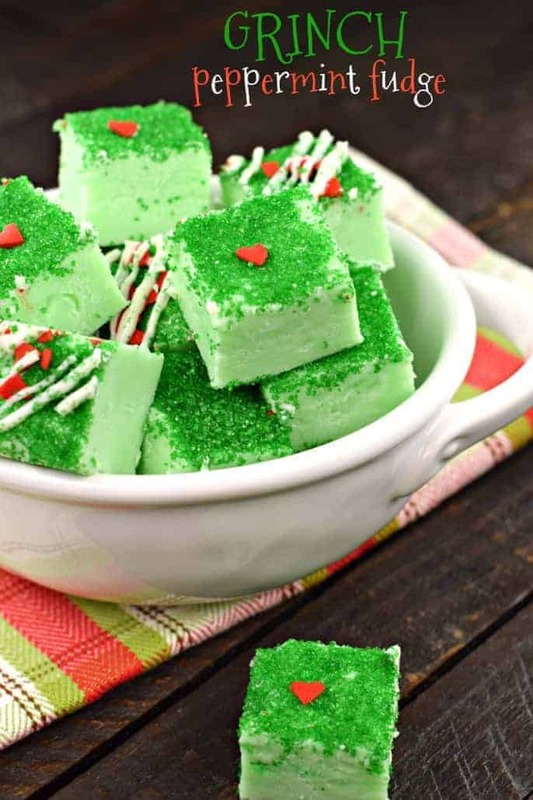 This festive Grinch Peppermint Fudge is creamy and melts in your mouth! You'll love how easy it is to make, and it's fun to see on a plate of cookies and candy! Add white chocolate morsels, marshmallow cream, peppermint extract, and green gel food coloring to a large mixing bowl. Set aside. In a large, heavy saucepan, add butter, cream, sugar and salt. Bring to a boil over medium high heat, stirring frequently. Once boiling, continue to boil for a full 4 minutes, stirring constantly. Remove from heat and pour over white chocolate mixture. Using an electric mixer, blend for about one minute, until morsels are melted and mixture is smooth. Pour mixture into prepared baking dish. 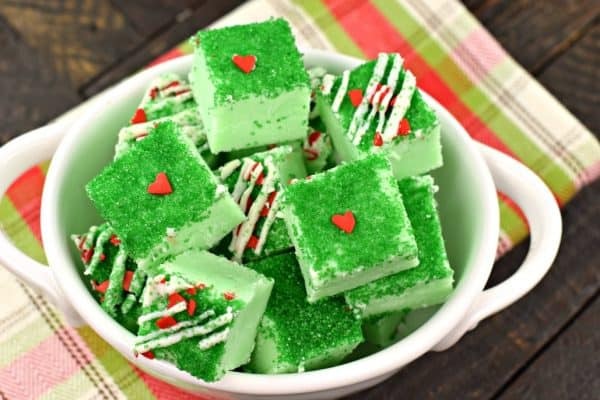 Immediately add green sugar and red heart sprinkles to the top, pressing them gently into the fudge. Refrigerate for two hours (or overnight). Do you think it would affect the result if I use regular food coloring as oppsed to gel coloring? I prefer NOT to use regular liquid food coloring as it can sometimes make the chocolate sieze up.